Enrolment and attendance data is collected eight times per year (at the beginning and end of each term). In each term the first reporting period covers weeks 1 to 4, and the second reporting period covers weeks 5 to 8. The average enrolment number is the average enrolments of students over the four week reporting period. The attendance rate is the proportion of time students attend compared to the time they are expected to attend during the four week period. New enrolment and attendance processes were introduced in 2013 that provided a richer, more robust and highly validated dataset. Due to these enhancements, 2013 represents a break in series and therefore enrolment and attendance data prior to 2013 cannot be compared to 2013 or onwards datasets. In addition, an important part of Every Day Counts is the capturing and reporting of high quality enrolment and attendance information, including reporting on reasons for non-attendance. 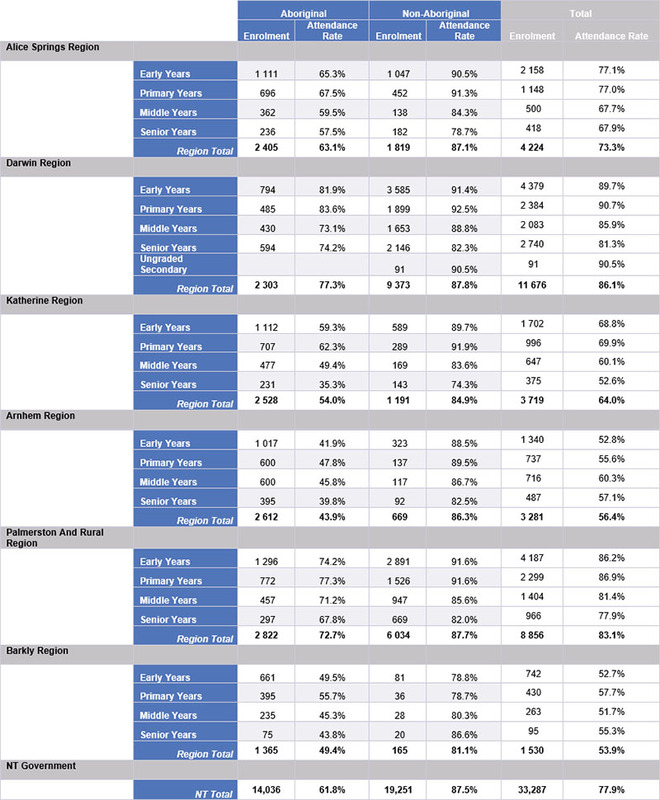 The tables below show enrolment and attendance (E&A) data for Term 3, 2018. Both the enrolments and the attendance rates are calculated over the two reporting periods within the term. 1. 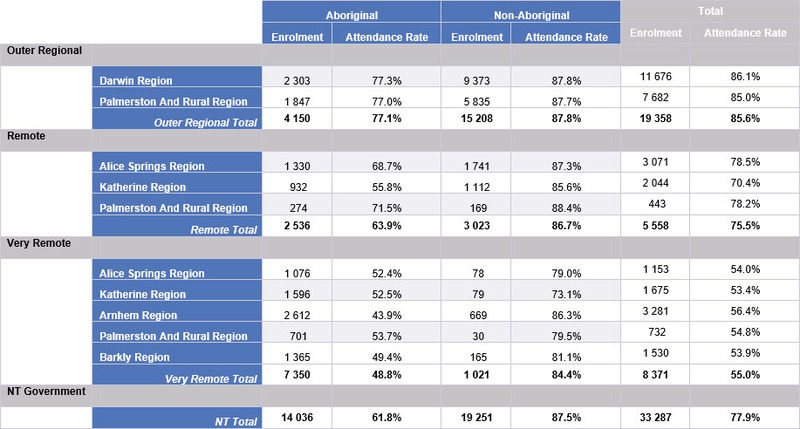 The data in the above table excludes 36 enrolments from Top End School of Flexible Learning (Tivendale) and 29 enrolments for Centralian Senior College (Owen Springs). Both schools have an attendance rate of 100 per cent. 2. Calculations are based on precise data, due to rounding some totals may not correspond with the sum of separate figures. 3. Ungraded students are in an interim year level until students can be assessed and assigned to a year level. 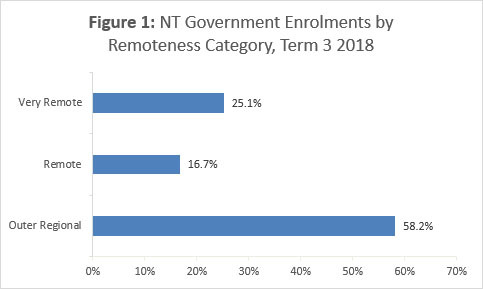 The data below show a combination of enrolment and attendance by provincial, remote and very remote (E&A) data for Term 3, 2018. Note: Due to new Enrolment and Attendance processes introduced in 2013 to provide a richer, more robust and highly validated dataset, data prior to 2013 cannot be compared to 2013 or onwards datasets.